Team GB has given us hundreds of special moments at the Olympics, with the likes of Mo Farah CBE, Jessica Ennis-Hill CBE, Greg Rutherford MBE, Sir Chris Hoy MBE, Laura Trott OBE and many more lighting up London 2012, not to mention countless other national treasures in previous years. When it comes to standout Olympic moments, it doesn’t always boil down to victory; sometimes, perseverance and symbolism can leave just as much of an impression. When Derek Redmond took part in the semifinals of the 400m at the 1992 Olympics in Barcelona, his dreams of clinching a precious gold went up in smoke when his hamstring snapped in the back straight. What happened next was beyond the imagination of all those whose eyes were cast on the race; he refused to get on a stretcher, stood up and continued the race limping. His father, Jim, then barged past security and joined Derek as the two completed the lap of the track together, a moment that prompted a standing ovation from 65,000 and millions of emotional tears all around the world. The incident wasn’t just memorable on British shores – it was the subject of one of the International Olympic Committee’s ‘Celebrate Humanity’ videos, while Visa and Nike also used footage from the incident for a series of poignant and touching adverts. Two decades on, Derek has rebounded from the disappointment of the race to carve out a career as an after-dinner speaker, where he discusses his career and the Barcelona incident in extensive detail, whilst also proving a fantastic event host. 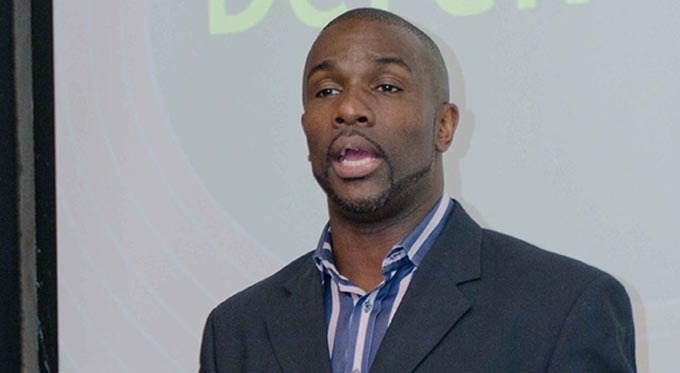 Derek Redmond is one of the most in-demand after dinner speakers on the UK circuit. To book him for your company’s next event, contact Champions Olympic Speakers by completing the online form or by telephone on: +44 1509 85 29 27.